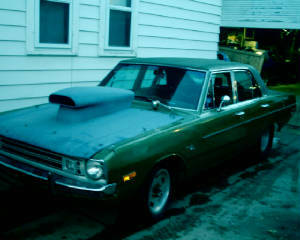 The 72 Dart twin Turbo project! DISCLAIMER< PLease Read Before advancing !!! My friend’s grandfather bought it in 1972. 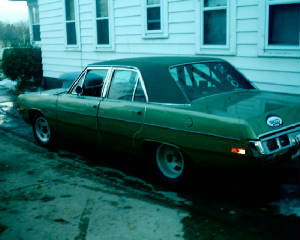 After he died in 1988, my friend and I swapped a 440 for the slant six it had from the factory. It was raced for many years, and then for the last three years it sat awaiting its fate. Well, I was in Illinois when my friend was going to start the disassembly but I said "hey, you can’t kill Gramp's Dart. 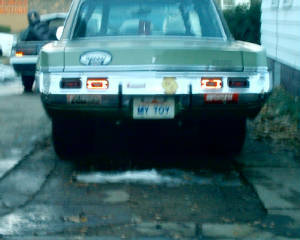 So, I rescued it with my trailer, no engine, transmission or any driveline part. Later, I picked up a 70- 413,727 transmission and a few turbochargers. I’ll be posting photos and more info when I start this project soon!